﻿ Can anyone stop Ronaldo in his current form? 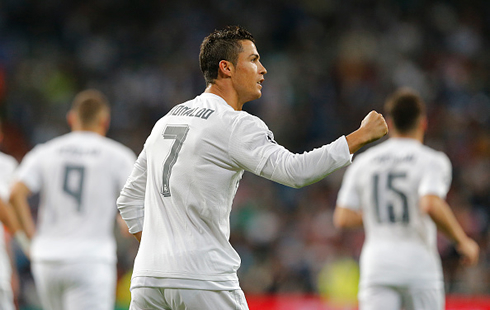 17.09.2015 » Can anyone stop Ronaldo in his current form? We all knew how things could change very drastically in football in just a matter of days. Ronaldo, who was facing one of his biggest goal scoring droughts of his career until just a few days ago, suddenly scored 8 goals in his last two games to become the top scorer in both La Liga and the UEFA Champions League. Who can stop him now? 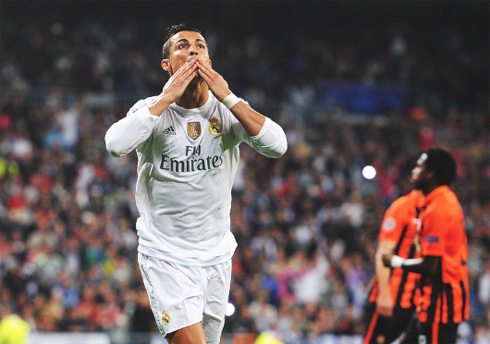 Scoring 8 goals in just two games is a sure-fire indication that Cristiano Ronaldo means business this season. 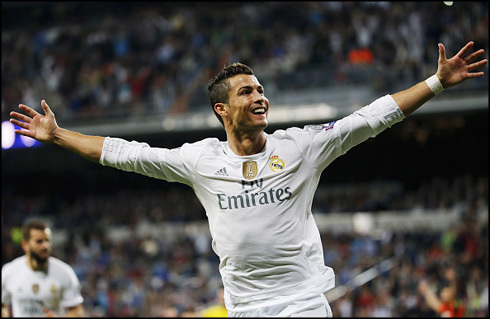 Yet another hat-trick in Real Madrid colours, this time in the Champions League in the Merengues' opening fixture against Shakhtar Donetsk, added to the 5-goal haul away at Espanyol which also put Ronaldo top of the La Liga scoring charts. It's the first time in his career that the Portuguese forward scores as many goals as this in two consecutive matches and all that skepticism and gloom about his start of the season has now been put behind. Ronaldo (321) is now only 2 goals away from becoming Real Madrid's all-time top scorer, as he prepares to dethrone Raúl (323) on the top of the rankings. The 2014 Ballon d'Or winner will undoubtedly fancy his chances of continuing his red-hot streak in front of goal in the upcoming league fixture against an opponent who he scored six goals against last season – five of which came at the Santiago Bernabéu. Ronaldo will undoubtedly be tipped to score again against a Granada team who not only have found it incredibly difficult to stop him in previous meetings, but also conceded seven goals in their first three La Liga fixtures this season. The 4-0 win against Shakhtar Donetsk was Real Madrid's fourth consecutive clean sheet in all competitions, which will come as a relief to Keylor Navas, who was on the verge of leaving the club as part of the deal to bring David De Gea to the Spanish capital. Navas is certainly taking his chances to prove to Rafa Benitez that he is good enough to be the number one for the foreseeable future, but the Spanish manager has been turning his attention a lot more to Ronaldo, lauding him as the best player in the world and one of the most gifted he has ever coached. It is easy to see why, with Cristiano Ronaldo now recognised as Real Madrid's all-time leading scorer in La Liga, the Champions League's all-time top scorer and just two goals behind surpassing the club's legendary striker Raul's haul of 323 in the famous white shirt. You would not bet against Ronaldo pushing himself to the maximum against Granada, in an effort to surpass the record in style with another three-goal haul (or even more). Real Madrid have won seven of the previous eight meetings against Granada, and they will undoubtedly be highlighted as resounding favourites on footballscores.com to beat Jose Sandoval's team yet again. The fact that Eibar and Villarreal have already put three past them this season does not bode well ahead of the daunting trip to the Santiago Bernabéu, with their only hope of getting a result likely to come through sticking men behind the ball and making it difficult for Ronaldo and company to break them down. However, with the former Manchester United winger in supreme form and the Merengues appearing to be finding their groove again, it would not come as a big surprise if the team are able to replicate the resounding 6-0 victory of last season against Granada on Saturday afternoon. Cristiano Ronaldo next game will be for Real Madrid on the 19th of September of 2015, against Granada. You can watch Juventus live stream, Real Madrid vs Granada, Barcelona vs Levante, Manchester City vs West Ham, Chelsea vs Arsenal, and Darmstadt vs Bayern Munich, all matches delivered through our soccer live game pages.